“I put this moment… here. I put this moment…here. I put this moment…over here.,” delivers more than expected from a group exhibition predicated on participation in a career development program for artists. Curator Jorge Rojas deftly finds commonality among the artist fellows of Aljira’s Emerge 11 and positions them within the realms of personal experience, identity and memory. The results are authentic, lacking the gratuitous quality that degenerates these types of exhibitions into a showcase. The Emerge program, founded by Director Victor Davson in 1999, is highly competitive. It receives hundreds of applications for 22 available slots. Aljira’s mission includes mentions of inclusivity, bridging racial, cultural and ethnic divides, and diversity. Davson is quick to point out this year’s fellows encompass these principles. The artwork, too, is equally varied in media and approach while remaining balanced in scale. Some of the highlights of the exhibition include Stephanie Powell’s glossy black installation Witches’ Séance (getting down to the nitty gritty). 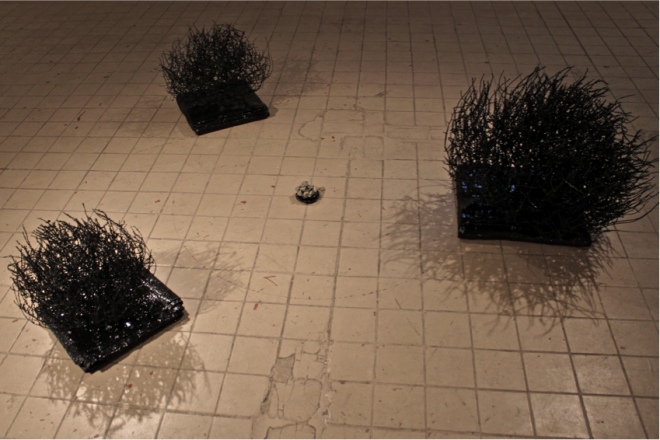 The work consists of a mise-en-scène formed by a triad of black lacquered tumbleweeds set atop neatly folded wool military blankets. Set in a triangle directly on the floor, the center contains an offering in the form of a small cairn of pyrite stones. The piece evokes a fractured mysticism of converging and disparate influences. Phoenix Lindsey-Hall’s aloof ceramic stoneware pieces employ this time-honored technique in a contemporary manner. 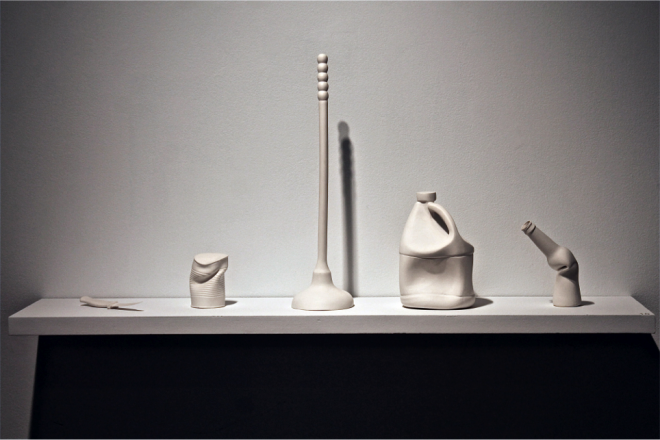 Disengaging ceramics from their historical function as vessels, containers and food service, Lindsey-Hall creates white-washed household objects that are rendered impotent by their bent and torqued appearance. Lindsey-Hall’s knife, tin can, plunger and detergent bottle are cold and lack familiar markings, heightening a sense of disconcertment with the viewer. The knowledge that these items were used as weapons in hate crimes conflates danger with domesticity. Using similar obfuscatory techniques, but speaking to other matters, Nobutaka Aozaki finds fertile ground for Modernist painting. 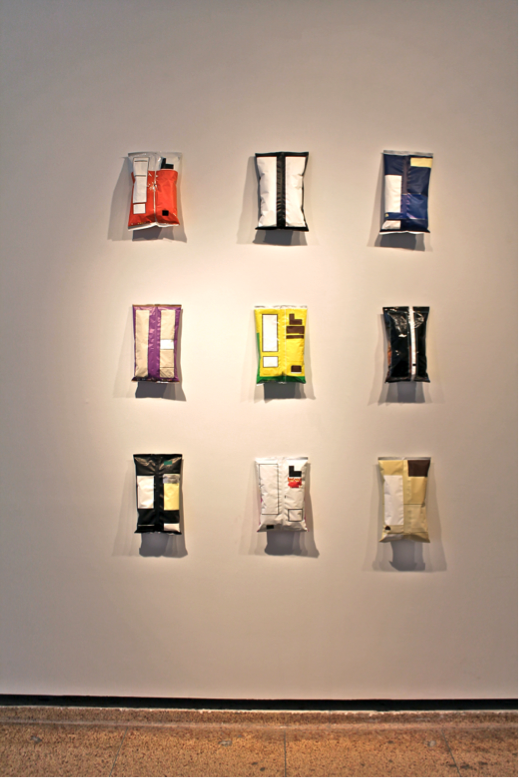 His Chips Paintings, altered potato chip bags, are arranged serially and painted over to conceal any text or logos. The result is a puffy grid of diminutive color field paintings that touch upon notions of consumerism, art historical canons and hegemonies related to low and high culture. Caroline Mak’s Stitched is less heady in approach. Her site-specific installation winds its way up a column and onto a ceiling beam. Starting at the base, large accumulations of tape arranged in obsessive frills are interrupted by swaths of bubble wrap and lace. These accretions give way to more open areas where lines fish their way from midway up the column toward the ceiling at an angle. 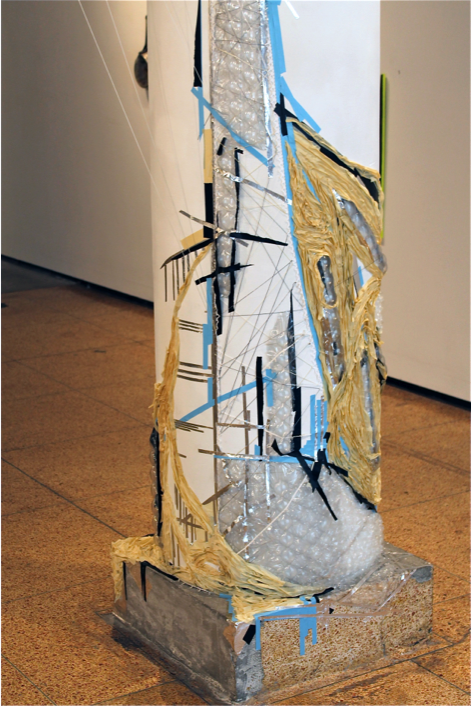 This labor-intensive piece takes advantage of a normally problematic area in the gallery, the Doric column, which bisects the gallery’s main walkway while visually interrupting it. Mak’s balance of textures, volume and tones, with a few pops of color, successfully addresses this problematic architectural feature and makes it a positive focal point. There are other notable works such as William D. Caballero’s How You Doin’ Boy? Voicemails from Gran’pa. His four minute video loop is a hilarious montage of real voicemails set to a simple backdrop which includes a miniaturized model of his grandfather in boxers and a sleeveless undershirt. Tai Hwa Goh’s mixed media wall installation, Lulled Land, concomitantly evokes a mythical landscape and cellular matter. The organic form of the paper, paint and collage reinforces the narrative. Jennifer Williams’ Episodic Drift #6 commands a compelling presence in the front window. The series of photographic cut-outs of ladders are hung at vertiginous angles from the ceiling. Judging from the success of many of the past Emerge fellows, these artists are on their way to thriving artistic careers. After viewing Emerge 11, it is certain that these artists already have something worthy to say, and that they’ve mined their personal experiences and interests to produce strong and engaging artwork. It will be interesting to see how the “moments” spent in Emerge will influence this talented group of artists. Jeanne Brasile is an independent curator and artist. She is currently the Director of Seton Hall University’s Walsh Gallery and teaches in the university’s Graduate Program of Museum Professions. She can be contacted at jeanne@jeannebrasile.com. “I put this moment… here. I put this moment…here. I put this moment…over here.,” on view through December 20th | Aljira – A Center for Contemporary Art | 591 Broad St, Newark, NJ 07102 | (973) 622-1600 | Hours: Wednesday – Friday 12 – 6pm, Saturday 11am – 4pm | Aljira is a Major Arts Institution as designated by the New Jersey State Council on the Arts, and is a Warhol Initiative participant.